Construction waste, as the name suggests, is the residual waste left behind after or during a construction or from certain industrial processes. Such waste usually comprises of materials that can be hazardous to health if not dealt with properly. Construction materials such as electrical wiring, metal nails or rods, electrical wiring can be the example of construction waste along with building materials such as bricks, concrete, unused wood planks or parts. Construction waste may also comprise of other hazardous waste such as lead and asbestos. Over 90 percent of construction waste is inert and is used for reclamation of land. The remaining 10 percent is made up of organic materials such as wood and timber and can be recycled for various other uses. It is important to manage and dump all this construction waste in the proper manner so that there can be optimum utilization of resources and wastage can be minimized. With so much construction under process in the recent times to build infrastructure, construction waste disposal has become of critical importance. Governments in various countries have strict laws for disposal, re-use, and recycling of such waste. One of the most efficient ways of doing this is separating different kinds of waste on the site itself. This requires added effort and time but is an investment that has long-term benefits for the entire community. Another aspect that can help in construction waste management is careful planning. It leads to the gauging and ordering of materials accurately. Also, using good quality building material reduces construction waste by ensuring minimum rejections. Bin rental services can also be helpful by functioning as links between on-site construction waste and recycling sites. Watch our Construction waste bin rentals video. 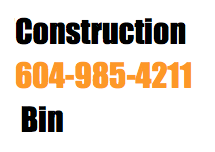 Watch our construction bin rental service in Vancouver.